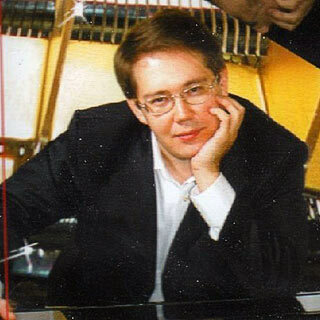 He is currently the principle soloist at the Moscow State Philharmonic Union “Mosconcert” and has been teaching piano at the Moscow State Conservatoire since September 2001. He also gives master classes internationally. Roustam Koudoiaroff was born in Kazan, Tatarstan, Russia. He studied at the Kazan State Conservatoire with Prof. N. A. Fomina and graduated in 1993. He then continued his postgraduate degree at the Moscow Tchaikovsky Conservatoire with the renowned pianist, Nicolai Petrov. Roustam Koudoiaroff is a prize-winner of the Jose Iturbi International Piano Competition in Valencia, Spain and the winner of the Konzerteum International Piano Competition in Greece in 1996. He has also won the All-Russia Safonov Piano Competition in 1997. He has taken part in international music festivals such as the Pianoforum in Kazan, International Festival of Contemporary Music “Europe-Asia” in Tatarstan, Shostakovich-tage in Berlin, Music of friends in Moscow, Trondheim chamber music festival in Norway, The Spring in Russia in Moscow, Mozart festival in Kazan, Festival of Music of Poulenc in Moscow. He has appeared with recitals and concerts with many symphony and chamber orchestras throughout Russia, Ukraine, Germany, Spain, Greece, South-African Republic, Great Britain and Denmark. He possesses a wide range of repertoire in solo, chamber and concertos ranging from Baroque to Modern and has also premiered performances of new and “forgotten” music, such as chamber and piano music by Richard Dubugnon, piano quintets by Frank Bridge, Ralph Vaughan Williams and music of Croatian composers. Roustam Koudoiaroff broadcasts regularly with the Radio and TV corporations in Russia. His first CD was released by Classical Records in 2005 and consists of works by Sofia Gubaidulina, Liszt, Chopin and the premiere recording of the Three dances op. 20 by Richard Dubugnon.